The CRISM Stamp Layer will display stamps for all observations acquired by the Compact Reconnaissance Imaging Spectrometer for Mars (CRISM) onboard the Mars Reconnaissance Orbiter. 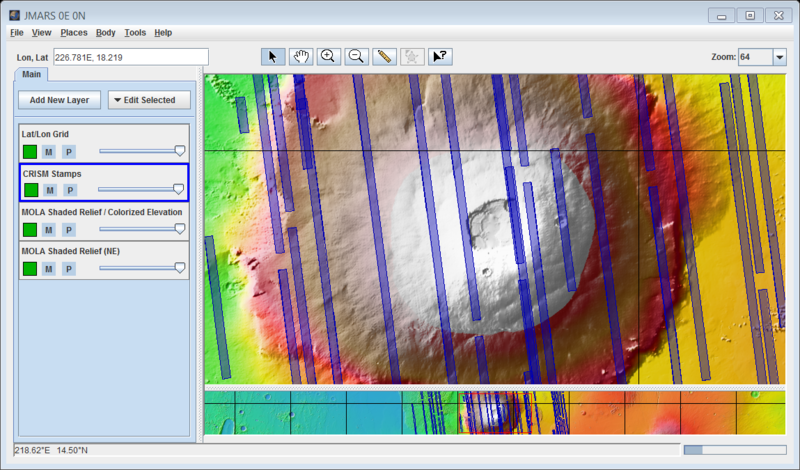 While the search interface is similar to the THEMIS Stamp Layer, there are some differences that allow users to search for observations based on the unique parameters associated with CRISM observations. Open the Stamp Layer: Chose "Add New Layer" -> Click the drop-down menu and select "Imagery" -> Make sure "Image Sets" is selected and click "CRISM". 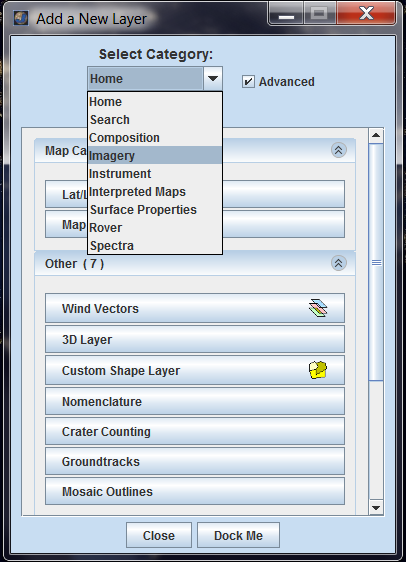 NOTE: A search can be performed with parameters from multiple categories. Enter Search Parameters: It is not necessary to enter values for each parameter, but the more specific your search the faster it will be. The allowable values for each field are given in the quick reference table below followed by more detailed descriptions of each search parameter. You can also click "Set Lon/Lat to bounds of View" to view only the stamps that are in the Mainview. This will be faster than loading all of the stamps that are available. Perform Image Search: Clicking OK will make the Stamp Layer perform the search and display the results. Depending on how specific the search parameters are, it may take the Stamp Layer a few minutes to find and create stamps for all of the images. Once the stamps are displayed in the Viewing Window, users can right-click on an outline to view the image in a web browser. A rendering option for CRISM stamps is in the works, stay tuned! v is the version numer, expressed as 0-9 then a-z. The type of observation being made, specified by resolution, number of bands and compression. 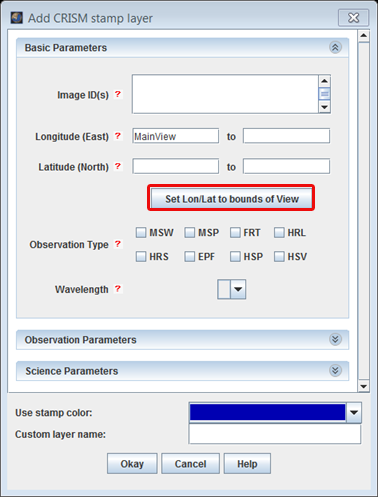 Specifies whether the observation was a VNIR observation (Short) or an IR observation (L). This is the approximate latitude on the planet Mars of the image center. All values are based on the IAU 2000 aerocentric model of Mars with north positive latitude. Currently, only CRISM targeted RDRs are available in JMARS. 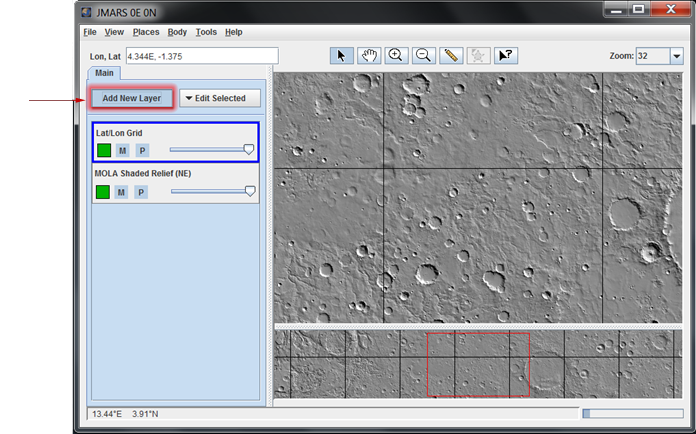 CRISM data has been divided into volumes for delivery to the Planetary Data System (PDS). The number of cross-track pixels acquired by the instrument. The number of along-track pixels acquired by the instrument. The horizontal dimension, in pixels, of the area over which pixels were averaged prior to image compression. CRISM can acquire data in either a fixed position mode or a dynamic mode that tracks a location on the surface to increase total integration time. The internal data acquisition rate used for acquiring the observation. The rate at which frames of data in a CRISM EDR were returned. The commanded instrument exposure time for the given observation. The resolution mode of a wavelength of frequency channel. 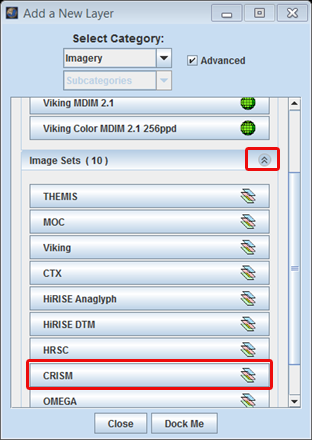 Identifies which of the four CRISM onboard menus of rows was selected for downlink. The temperature of the sensors. The temperature of the optical bench. The temperature of the spectrometer housing. The temperature of the onboard integrating sphere. The temperature of the IR focal plane electronics (if Sensor_ID = L) or the VNIR focal plane electronics (if Sensor_ID = S). The number of spectral bands in an image or other data product. The distance from the center of the sun to the center of the target body. Earth year during which the observation was acquired. Earth day-of-year during which the observation was acquired. Derived for the center of the image, this is the angle between the Sun and a "normal" drawn perpendicular to the planet's surface at the time the image was acquired. A higher incidence angle means that a person standing on the ground would see the sun lower toward the horizon. Measured from the center of the image, this is the angle between the CTX and a "normal" drawn perpendicular to the planet's surface. This is the angle between the sun, the surface, and the CTX at the time the picture was obtained. The average magnitude of the MOLA slopes, in deg, within the observation footprint. The average MOLA elevation within the observation footprint. This is the local solar time on Mars at the center of the image relative to a division of the martian day into 24 equal parts. A martian day is slightly longer than 24 hours and 37 minutes long. The CRISM Stamp Layer's functions are identical to the functions of the Stamp Layer and are explained in detail on the Stamp Layer page.